Fall is quickly approaching and with the dry air comes parched skin and flaky lips, two things that I do not want to have this year. Skincare is a whole 'nother post but for now I'll share an easy peasy lip treatment that will help your lips feel conditioned and smooth. Way back when, Sephora was offering a mini Fresh Sugar Lip Polish with online orders so I jumped on the chance to try this for free rather than shell out the normal retail price of $22.50, yikes! A little goes a long way though so I suppose it might be worth your money if you enjoy a good lip exfoliant. Brown sugar is blended with oils like jojoba and castor as well as shea butter and some other nourishing ingredients. The scrub is balmy in texture and the particles stick together so you won't get sugar scrumbs flying all over the place. The sugar is abrasive enough to get rid of small particles of dry skin but not painful as long as you gentle use your fingers to rub the product in circular motions. The oils leave a Vaseline-like feeling on the lips that doesn't immediately rinse away with water. I would suggest using this in the evening or during the day if you don't plan on applying makeup right away. There is a greasy film that envelopes the lips and surrounding skin that will cause makeup to go on unevenly. The scrub smells similar to the Fresh lip balms, a nice citrus-y smell, which lingers for about as long as your lips are greasy. 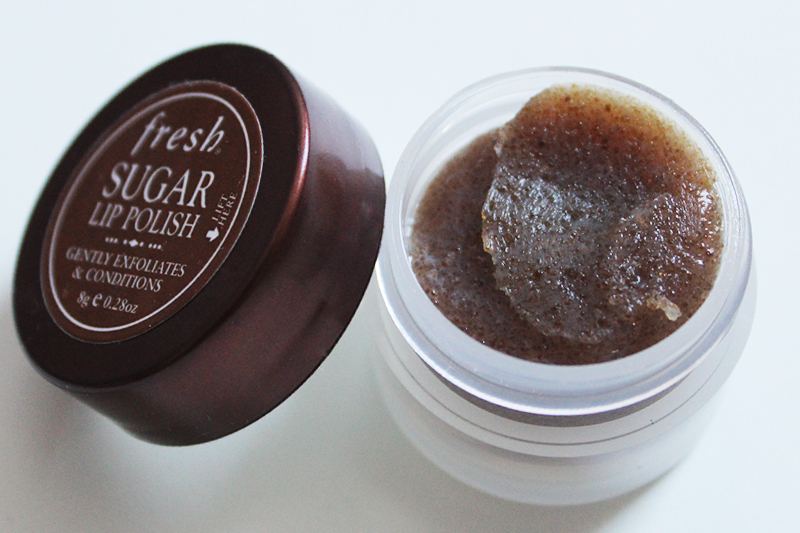 While it's not a bad lip scrub by any means, the Fresh Sugar Lip Polish doesn't wow me enough to justify the price tag. It does it's job but the greasiness makes it hard to use in a jiffy if I want to get on with doing my makeup immediately. If you enjoy luxurious basics and like the scent of Fresh lip balms, you might enjoy this very much. What are your favorite lip scrubs? Do you think it's worth it to shell out the money for a sugar scrub that you could probably make in your kitchen?